In Africa, Christmas day begins with groups of carolers walking to and fro through the village, along the roadway, by the houses of the missionaries, singing the lovely carols known the world around. Often people may be awakened by a group of carolers beginning to converge on the house of worship. They return home to make final preparation as to the clothes one must wear and also as to his offering for the Christmas service. The most important part of their Christmas worship service is the love offering, this is the gift in honor of Jesus. Then at about 8 or 9 o'clock everyone makes their way to the celebration of the birthday of Jesus. Everyone who attends the service goes forward to lay down their gift upon the raised platform near the Communion table. Not one person will attend the service without giving a gift. 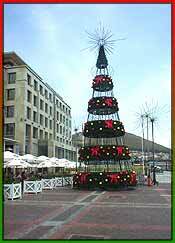 Christmas in South Africa is a summer holiday. There is no snow, but it has many flowers, many beautiful varieties of cultivated and wild flowers being in their full pride. Homes are decorated with pine branches, and all have the decorated Christmas fir in a corner, with presents for the children around. At bedtime on Christmas Eve, children may also hang up their stockings for presents from Father Christmas. In Ghana, on Africa's west coast, most churches herald the coming of Christmas by decorating the church and homes beginning with the first week in Advent, four weeks before Christmas. This season happens to coincide with the cocoa harvest, so it is a time of wealth. Everyone returns home from wherever they might be such as farms or mines. On the west coast of Africa, in Liberia, most homes have an oil palm for a Christmas tree, which is decorated with bells. On Christmas morning, people are woken up by carols. Presents such as cotton cloth, soap, sweets, pencils, and books are exchanged. Also in the morning a church service is held in which the Christmas scene is enacted and hymns and carols are sung. Dinner is eaten outdoors with everyone sitting in a circle to share the meal of rice, beef and biscuits. Games are played in the afternoon, and at night fireworks light up the sky. In Africa, it is the traditional dinner of either turkey, roast beef, mince pies, or suckling pig, yellow rice with raisins, vegetables, and plum pudding, crackers, paper hats, and all. In the afternoon, families go out into the country and usually there are games or bathing in the warm sunshine, and then home in the cool of the evening. Boxing Day is also a proclaimed public holiday usually spent in the open air. It falls on December 26 and is a day of real relaxation.